Memorials to an anti-apartheid leader have been unveiled in the north London borough he called home for 30 years. Oliver Tambo, the late president of South Africa's African National Congress, was a resident of Haringey after being forced into exile in 1960. He is being remembered with a plaque in Alexandra Park Road, Muswell Hill, where he lived, and a bust in Albert Road, Haringey. Justice Secretary Jack Straw said Mr Tambo was an "inspiration". 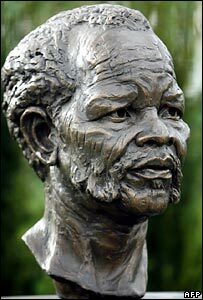 The bust was sculpted by the late Ian Walters, who also created former South African President Nelson Mandela's statue in Parliament Square. Mr Tambo and Mr Mandela were life-long friends and comrades in their struggle against the apartheid regime. Mr Tambo died in 1993. "The lasting legacy of Oliver Tambo does not rest in this memorial, as great as it is," said Mr Straw. "Nor does it lie in the prosperous and free future South Africa can now enjoy. "His legacy will be in the hope he has offered to many across the world who struggle against oppressive dictatorships. "And the conviction that the sacrifice of a few can bring about a great change for the many."